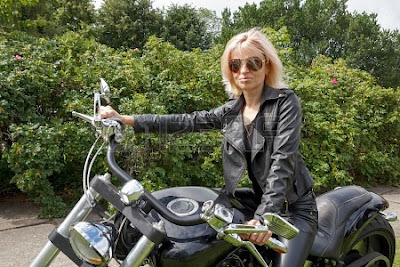 Riding your motorcycle can be fun in almost any kind of weather or season, providing you are properly prepared. However, inclement weather combined with wind chill can make riding miserable and even dangerous is you don't have the right equipment. Here are some suggestions to help you stay warm while riding in even the coldest conditions. First, you need to protect your hands as they are a part that is very exposed and very vulnerable to the cold. During the winter months, winter gloves with Gore-Tex or a similar material are a must. Do not skimp when it comes to getting adequate protection from the cold - paying an extra $10 to $20 to make sure your hands are protect is well worth the price! However, if you have a special pair of riding gloves that you just can't bear to ride without, layering gloves is another option. You may want to consider even putting a pair of latex gloves on under your favorite riding gloves. They can provide extra insulation and help trap your natural body heat, provided you are not allergic to latex of course. Wrists are an often neglected body part, and you need to take measure to make sure they are protected as well. If your gloves already offer wrist coverage you do not need to worry, but if they don't you should consider purchasing a pair of winterized wristbands. In cold weather, you will also obviously want to wear warm shirts and pants. A thermal layer is usually a must under a warm shirt and your jacket. Try to choose materials that will help wick moisture away from you body if at all possible. You will want to take a good look at your jacket to see if there are areas that allow the wind in. If so, consider sewing or even duct taping those portions to keep the wind out. You should also carry rain gear with you whenever there is an even slight chance of showers. Consider if you need additional layering under your helmet as well. A ski mask may be suitable for the coldest weather, while a beanie may work in other situations. You will also want to take measures to keep your helmet from becoming fogged up when you ride. Some riders suggest breath mints help, while certain helmets already come with a breath deflector that will help solve this problem. Feet also need to be well protected, and getting state of the art ski socks well help as well as insulated boots. Finally, for those riding in the worst conditions, you should seriously consider purchasing heated riding gear and warming packs for your hands and feet. These will make a huge difference in terms of your enjoyment level when riding in the coldest weather conditions. Belum ada tanggapan untuk "Tips For Staying Warm On Your Motorcycle"